The BlackBerry Q5 may not be the first BB10 smartphone to feature a keyboard - that award goes to the BlackBerry Q10 – but it is the first BB10 smartphone to feature a price point which pits it against the likes of the Samsung Galaxy S4 Mini and the Sony Xperia SP. With contracts starting as low as £21 per month this then is the replacement of BlackBerry's famous Curve series (including the BlackBerry Curve 9320) which blended high-quality design with a price tag that meant anyone could get in on the action. While the price certainly fits the description, the handset itself somewhat falls short of its predecessor, not on paper maybe, but after spending a week with it, the cracks begin to show. Reliable build quality and design are BlackBerry's bread and butter department, creating phones that are sturdy, hardwearing and have keyboards that can survive everything short of a direct nuclear attack (not literally, you understand). Sadly this is its first failing. The all-plastic design feels frankly cheap, not even Samsung Galaxy S4 cheap, but seriously 'my first phone' cheap. That's not to say it isn't rugged, we accidently dropped the Q5 from chest height and it suffered absolutely no blemishes whatsoever. On the side there's a volume button with a centre button for voice commands, on the top there's the classic lock and on/off button. All these use the same material as the rest of the body and while that certainly adds a sense of some continuity they're a million miles from the aluminium cut buttons used on the BlackBerry Z10 and the Q10. The Q5's saving grace is the weight, this is a very light phone coming in at just 120g making it a lot lighter than say the HTC One and marginally lighter than the Samsung Galaxy S4. It certainly feels more portable because of it. Under the hood the Q5 features many of the same specs as the Q10 including a Qualcomm Snapdragon S4 dual-core processor and 2GB RAM. Internal storage is lower with only 8GB and gone is the mini HDMI out port on the side. We won't go into this too much as it's essentially the same stock BB10 OS found on existing BB10 handsets (check out our BlackBerry 10 review for more details), what you get in short are off-screen gestures and BlackBerry Hub which accumulates all your emails, texts and messages through social media. BlackBerry 10 is still missing some vital apps such as Instagram and Google Maps but if you're that desperate BlackBerry has made it incredibly easy to side-load Android apps onto its handsets and best of all it doesn't void the warranty. One of the biggest problems with BlackBerry 10 on the Q5 however is that it feels cluttered through the smaller screen. We constantly kept minimizing apps by accident when scrolling through web pages because our fingers kept catching the bottom bezel. There's no real fix for this so you have to adapt or move on. The Q5 features a 3.1-inch LCD screen with a 720x720 resolution and 329ppi, it's bright, clear and certainly a high-enough resolution for most peoples eyes. Why LCD you ask? Well AMOLED is more expensive so while you do get a drop in price, what you also get is a drop in screen quality. What you end up with is an extremely high-resolution display but one where colours feel just a little faded and contrast ratios could be improved. The Q5 has a full QWERTY keyboard on the front with isolated keys offering what you'd think is a faster typing experience over its rivals. While the keys are firm and responsive they are tiny bit slower to get the hang of compared to other efforts, and are very reminiscent of the Curve 8520. Luckily they feel sturdy and give a reassuring click so while they may take a while to get used to, you can be safe in the knowledge that they won't be breaking anytime soon. 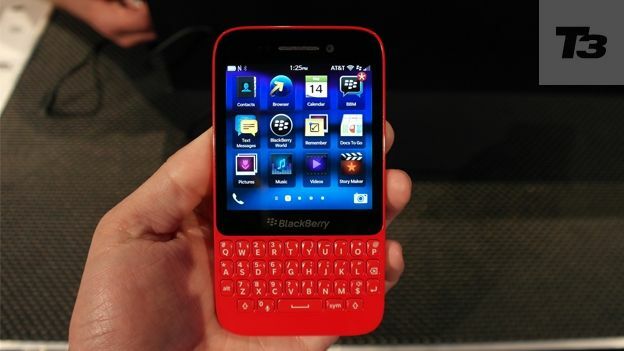 This is probably going to be the decider for BlackBerry fans. It doesn't come with a removable battery, and for the life of us we can't work out why. Ok so it's 2180mAH is going to be more than enough for a day in the office, but for those that travel or suffer longer hours, a second battery can be a godsend. The Q5 is a tough call to make. It's almost certainly going to become the work BlackBerry if the Z10 hasn't already and while we commend BlackBerry's intentions in trying to create a BB10 handset for both work and youth, it's kinda missed the point. If you're going to build a phone that offers the same specs as the Sony Xperia SP then you at least need to price it accordingly. The problem is it costs £348, that's nearly £70 difference compared to the SP's £280. So what are you paying extra for? The keyboard? Well the keyboard is certainly good but it's not as good as the Q10. The screen? Same story. In short, the Q5 is a smartphone that at present is stuck in limbo, it hasn't got the user experience or the build quality to compare with the Samsung Galaxy S4 and the HTC One but it's also quite expensive as a mid-range phone. Would we recommend it? If you're after a typing experience but can't afford the frankly silly price of the Q10 then this is definitely your best bet, but if you're after something more than that we'd have to suggest looking elsewhere.